The Hotel Hacienda La Noria is approximately 12 blocks south of the city center, though it still offers relative proximity to so many great Oaxaca attractions. Among these attractions are the historic center’s Zocalo (main square), the Convento de Santo Domingo, and the Museo Regional de Oaxaca. Guests can also travel between the hotel and the airport in a relatively short amount of time, and both taxis and buses are readily available near the hotel itself. Also worth noting for Hotel Hacienda La Noria guests is the fact that guided tours and rental cars can be arranged through the hotel, and secure parking is available at no extra cost for those who need it. 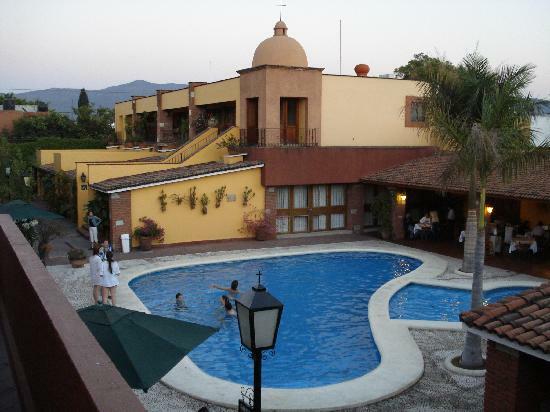 The Hotel Hacienda La Noria is satisfying on a range of levels. It has bilingual personnel, for example, and can help guests with any currency exchange needs that may arise. The reasonable rates are appealing as well. In relation to the hotel’s facilities, highlights include an inviting restaurant and a refreshing swimming pool. As for the 81 guest units, they are rather straightforward and have a rustic colonial edge that fits in with the hotel’s overall colonial style. Cable TV and private bathrooms are among the in-room amenity highlights. Some of the rooms have air conditioning, while others have just ceiling fans to help keep things cool, so guests can choose accordingly.